Europe’s finest offshore marine protected areas have long been devastated by beam trawling and other damaging fishing methods because EU ministers and officials cannot agree whether fisheries have to comply with environmental law. Now the most egregious example of official neglect can be revealed: as well as being devastated by other damaging fishing methods the North Sea’s nature sites are being routinely zapped by “experimental” electric trawls. Pulse trawls use electrodes towed ahead of the net to produce an electric field to shock fish – mainly sole and plaice – off the bottom and into the net. Official UK sources confirm that the area in which pulse fishing has been given a controversial “derogation” from a ban on electric fishing since 2006 includes the Dogger Bank, the North Sea’s largest marine protected area. Average annual trawling intensity (swept area ratio of 1×1 minute grid cells) of the pulse trawls in the period 2009 – 2017 (ICES Report WGELECTRA 2018). 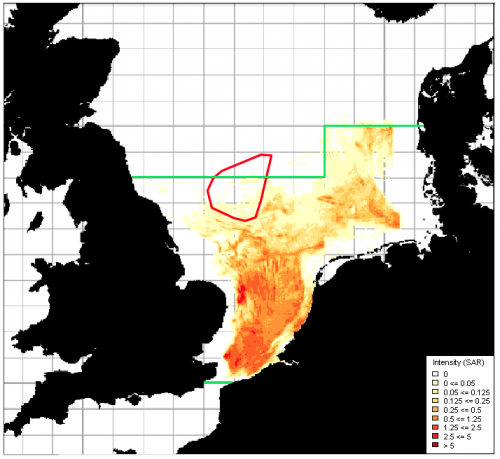 Dogger Bank Special Area of Conservation shown in red. The British, Dutch and German sectors of the Dogger Bank are all protected as a Special Area of Conservation under the EU Habitats Directive for the rich fauna they contain – which includes worms, crabs, clams, small flatfish and brittle stars, which form a food source for fish and other wildlife. Sand eels which live there are a rich source of prey for seabirds, fish, dolphins and porpoises. Marine conservation charities, the UK-based Blue Marine Foundation (BLUE) and BLOOM, a French charity, said that maps in an official study by the International Council for the Exploration of the Sea – the EU’s scientific advisers – showed clearly that there were pulse trawlers fishing on the Dogger Bank and in other EU marine protected areas. The tracks are clear, but vessel names are not included in the official data because EU fishing rules protect the fishing activities of vessels from public scrutiny for reasons of commercial confidentiality. Pulse trawling is controversial because it is indiscriminate in what it electrocutes and many of its effects have yet to be properly researched. Studies have shown it can break the spines of 12% of gadoid fish, reduces the hatching rate in cod eggs and kills 25% of young cod outright. No studies have yet been done on the effects of electric currents on the full range of sea bed creatures, including sand eels found on the Dogger Bank. There are fears that there could be lasting damage to the underlying ecosystem. As a result, this fishing practice has been banned in many countries, including China. Small-scale fishermen around the North Sea have protested about pulse fishing in or near their fishing grounds because they believe the long-term damage from this industrial fishing method will endanger their livelihoods. Next week in a meeting with the Austrian Presidency EU officials will decide on the future of electric fishing across the southern North Sea which has been highly controversial since the European Parliament voted by a majority of 402 votes to 232 in January to remove the derogation allowing it. Prior to 2006 fishing with electricity and explosives was simply banned under EU law. The UK has said it favours a compromise favoured by the Commission which would allow pulse fishing to continue as an experimental trial but not commercially as 84 Dutch vessels and three UK vessels appear to be doing. Charles Clover, executive director of BLUE, said: “It is vital that the primacy of environmental law over fisheries law is established before Brexit or it will be bargained away in negotiations afterwards. We are opposed to the use of electricity to catch marine life because its effects are potentially horrific, to judge by the accounts of fishermen who have witnessed them. “To that end, BLUE has filed a formal complaint to the European Commission over the fishing by electric pulse trawlers on the Dogger Bank which we believe is illegal. “There is nothing experimental about this fishery, it is a fully-fledged commercial operation and its environmental impacts while under-researched are potentially very harmful. Claire Nouvian, founder of the French charity BLOOM, said: “The discovery of electric trawlers routinely electrocuting marine life in one of Europe’s largest marine protected areas is just another layer of scandal on top of several we have already revealed about electric fishing. “We know that the European Commission initially authorised electric fishing against official scientific advice. We found out, a year ago, that the Dutch had exceeded the threshold of five per cent of their fleet allowed under the derogation. Then we discovered that the Dutch government had given millions of euros worth of subsidies to fishermen to convert their vessels – though most of these licences were illegal. These subsidies were only meant to be given for scientific studies and not for commercial fishing, which this clearly is. “Yet the EU’s trilogue process, which is meant to resolve this scandal, is going into a meeting with the Austrian Presidency suggesting a compromise that would allow electric fishing to continue. Everyone is acting as if nothing illegal had been going on. Jerry Percy from New Under Ten Fishermen’s Association said: “It is a travesty that powerful vessels, using a fishing method that is banned in many parts of the world are not only permitted under a dubious derogation to use this gear to fish in UK waters but also in marine protected areas. Electro-fishing uses less fuel than the principal alternative to it, beam-trawling and it comes into contact with and penetrates the seabed, though less deeply than beam trawling. As electric trawls are lighter, it has enabled trawlers to fish on large areas of soft ground, notably off the Thames estuary, where they could not previously fish.